One more session of consolidation took place in the Indian Equity markets as the benchmark NIFTY50 ended the day with modest gains of 29.65 points or 0.28%. Markets saw a quiet opening on expected lines and just when it started to correct in the late morning trade, short covering lifted the Markets. Bulk of the short covering was rollover related in nature. On Wednesday, we enter the penultimate day of the expiry of the current derivative series. We once again expect a tepid start to the trade. The rollovers will continue to dominate the trade and we once again expect the Markets to trade while continuing to resist to the 10650 zone. 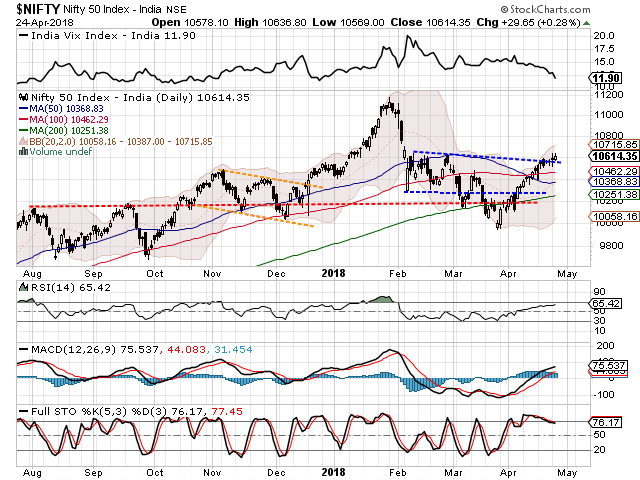 Wednesday’s trade is likely to see 10650 and 10695 acting as resistance levels. Supports come in lower at 10585 and 10510 zones. The Relative Strength Index – RSI on the Daily Chart is 65.4201. It has marked a yet another 14-period high which is bullish. RSI shows no divergence of any kind against the price. The Daily MACD stays in bullish mode while trading above its signal line. No significant formations were seen on Candles. 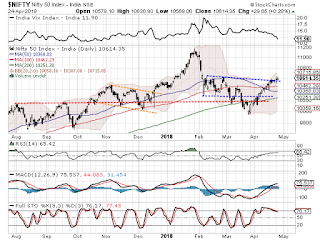 Pattern analysis shows that despite showing buoyant undercurrent NIFTY has not yet achieved a clear breakout from the broad rectangle trading range. A clear breakout will be achieved once the NIFTY moves past 10650 with some conviction. Overall, while having no second doubts on the buoyancy of the undercurrent, we still need to tread the Markets with caution. VIX has dropped to its lowest value in recent time and the NIFTY PCR (Put to Call Ratio) still continues to remain at elevated levels. These factors are likely to keep up move capped on the upside. In other words, with each up move that we see, we are likely to remain more and more vulnerable to profit taking bouts from higher levels. Apart from this, we will continue to see sector and stock specific performances occurring as well. We continue to reiterate to keep protecting profits vigilantly at higher levels while adopting a cautious view on the Markets. Good technical set up is observed in stocks like GATI, SNOWMAN LOGISTICS, SBI, CANFIN HOMES, BAJAJ FINSERV, GODREJ PROPERTIES, RELIANCE, ONGC, BHARAT FINANCIAL, and RAYMOND.